Ru Raynor is an artist, activist, warrior woman, and caravan dweller in an eco camp, which is exactly what she wanted to be when she grew up. She earned a degree in Ceramic Design at Central St Martins, and hopes to build a wood kiln in the near future. When she’s not campaigning against a 3rd runway at Heathrow airport she can be found making fire sculptures, cooking vegan meals with homegrown cabbage, writing fairy tales, cutting hair, sewing, gardening, and carrying out many more granny style forms of rebellion. Around two years ago, I said sod it to full time paid work, left my parents’ comfortable detached 1920s house, and moved onto a protest camp against 3rd runway at Heathrow Airport. I took this stand, because I believed that fighting for what I believed in could no longer be a part time peripheral part of my life and instead needed to become my full time engagement. As I write this now, in around 12 hours I plan to block a road going into the airport with my body, arms in tubes, voice slowly going hoarse from chanting. the women of Greenham Common, who blockaded an RAF base to protest against the use and ownership of nuclear weapons, starting in 1981 and disbanding in 2000.
the Ploughshares women, a group of 10 who smashed a fighter jet to bits to prevent it being shipped out to murder civilians. Emily Wilding Davidson, who threw herself in front of the king’s horse at the Epsom Derby in 1913 (and subsequently died), as part of the battle for women’s suffrage. Julia Butterfly Hill, who sat in a California redwood tree for 738 days to stop it’s destruction by the Pacific Lumber Company. Rose Boland, Eileen Pullen, Vera Sime, Gwen Davis, and Sheila Douglass; Ford sewing machinists who went on strike from their jobs making car seats in 1968, a move that eventually led to the establishment of the Equal Pay Act. 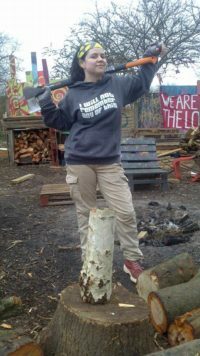 The women of the Heathrow 13, climate activists who cut through Heathrow Airport’s perimeter fence in 2015 and set up a tripod lock-on, shutting the runway for more than five hours. There are more, of course, we could fill a book or 20 with dangerous women, but first we must ask ourselves, why are we dangerous? Because we cost them money. Because we refuse to play by their rules. Because we don’t accept injustice. Because we won’t be silenced. There have always been dangerous women, and we are needed now more than ever. We are at tipping point for CO2 emissions, our oceans are dying, and a mass extinction of life on earth has begun. We are told it has always been this way, this “natural” friction between Mother Earth and Mankind, the two forces posed against each other. The wild, and the tamer. The impossible to subdue, and the conqueror. To hell with that sick submission. Let’s end this misogyny; against ourselves and against our mother. The narrative that puts formaldehyde on our fingertips and plastic into our oceans. That claws tar from under her skin, and seeps flame retardants into ours. That expects us to coat ourselves with a thousand creams, but blames us for not being a pure enough vessel for our babies. We can no longer sit down, shut up, smile, and shop. SIT DOWN: there is too much to do to stay still. Trees to be planted, empires to be crushed, minds to be swayed, seas cleaned, solar panels built, rivers cleaned, people loved. We must all play our role and encourage others to do the same. SHUT UP: now is not the time to stay silent. Speak out- against ecocide, racism, misogyny, transphobia, abuse, corruption, greed, colonialism, and all the other monsters in our closets. They will try to shut you down, attack your messages, destroy your fighting spirit. Do not let them tape your mouth shut with hate. SMILE: don’t tell us it’ll all be okay. Weep at what the lust for profit has done to our home, to our families, to ourselves. Screw up your face in rage. Resistance shouldn’t have to worry about looking pretty. We should be howling at what they have done to our mother. SHOP: Hit em where it hurts. You are a collection of atoms from the heart of a star and you have better things to do that choosing a cute new storage system for your over-abundance of face paint and impractical shoes. You do not need new clothes. You do not need another bag. You do not need a stick of palm oil, crushed beetles, lead, and perfume, designed to give you the lips of an aroused young woman. You definitely don’t need it in 8 different shades. Capitalism hurts us most, after our planet. But since the inception of advertising, we have been told it’s all for our benefit. From the looms that “liberated” us, to the arsenic green Victorian dyes that were to die for, the space aged TV dinners of the 60s, tumble driers, microwaves, heated rollers, high heels that deform our feet, perming chemicals that burn our scalps, that cool new modern centrally heated home… all for us? I don’t remember asking to be civilised. To be domesticated. I thrive in the mud and under the stars. Grow some food, reclaim your fields, reconnect with the earth beneath your feet and rebuild a community around you that’s just as angry and ready to take on the world. Let’s show ’em how dangerous we can be.